Marbles - Collect or Play → For Play and Groups → "Cobble Stack"
The "Cobble Stack" holds ten 7/8"(22mm) diameter marbles. 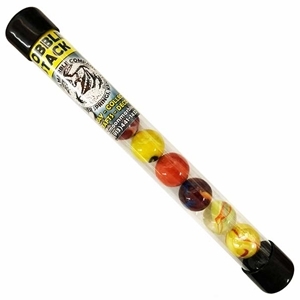 Some kids use these for shooter marbles or for dropping on other marbles in games. The cobble stack also makes a great addition to a 4" marble kaleidoscope (ask for transparent styles to go with kaleidoscope). Play with these marbles or save in package for future collectible. Warning! : Choking Hazard. This toy contains marbles. Not for children under 5 years.